Mark your calendar! Don't miss attending your favorite demonstrations in 2019. We look forward to seeing you! 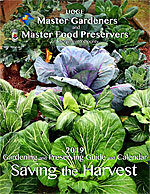 Need a calendar with monthly tips for growing and preserving garden produce? We have it for only $10! It makes a great gift for gardeners, cooks and you! We teach food preservation & food safety. Get your preserving on! The UCCE Master Food Preservers of Sacramento County are here to help you understand how easy it is to can, pickle, ferment, dehydrate and freeze food safely at home using research-based methods. UCCE Master Food Preservers volunteers are trained and experienced educators, certified by the University of California to lead demonstrations at the Branch Center and participate in farmers markets, community festivals, and other county events. The program is a public service of the University of California Division of Agriculture and Natural Resources, administered locally by the UC Cooperative Extension office of Sacramento County. Sign up to receive email reminders about our classes and demonstrations.